Light Tracer is an ambitious title designed to show you some really interesting new ways of playing a game. 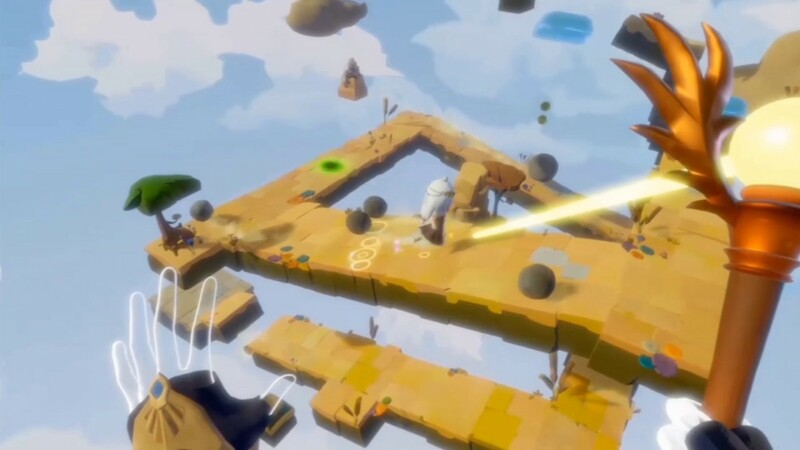 While this could have just been a typical action puzzle game, Light Tracer opts to incorporate VR and PlayStation Move. Unfortunately, that also means both of these are required in order for you to play the game, as there are no modes that let you just use the controller. Thankfully, One PR and Oasis Games were nice enough to lend me the equipment necessary to play the game. 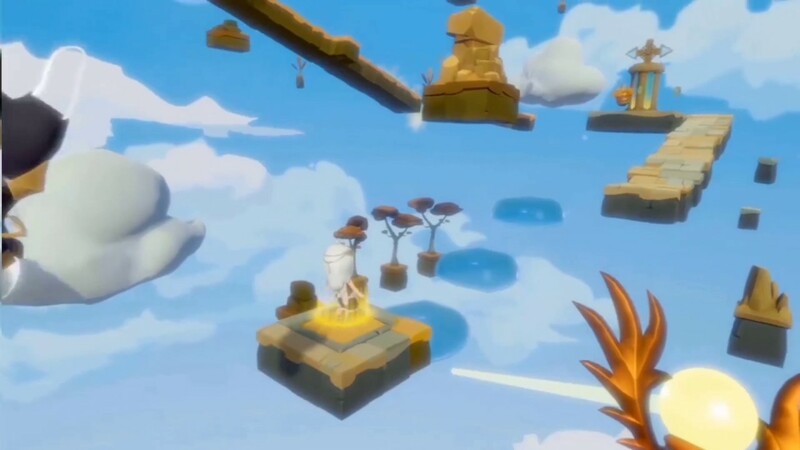 At first glance Light Tracer might appear to be a game inspired by titles such as Captain Toad: Treasure Tracker on the Wii U. However, the VR and PS Move controls turn Light Tracer into a completely different beast. You play as a “god” and are given a staff that shines a beam of light onto the playfield. The goal is to help a little princess navigate to the top of the Tower of Bellbatis. 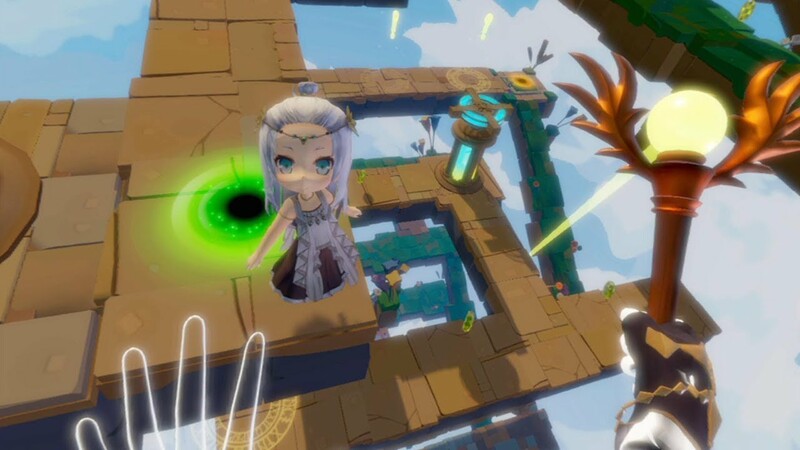 The game is a fairly lengthy one for a VR title and spans eight chapters filled with various levels, puzzles and bosses. The Move controllers are used to control your hands, with the right one being used for your staff while the left can be used to move the camera around and interact with certain elements in the levels. The key to getting past most of the levels is rotating the camera in a specific manner to reveal certain things that may not necessarily be apparent, such as switches or hidden paths. There are also gems located all over the levels which can be redeemed for bonus costumes. The princess can walk and jump as well as activate switches. 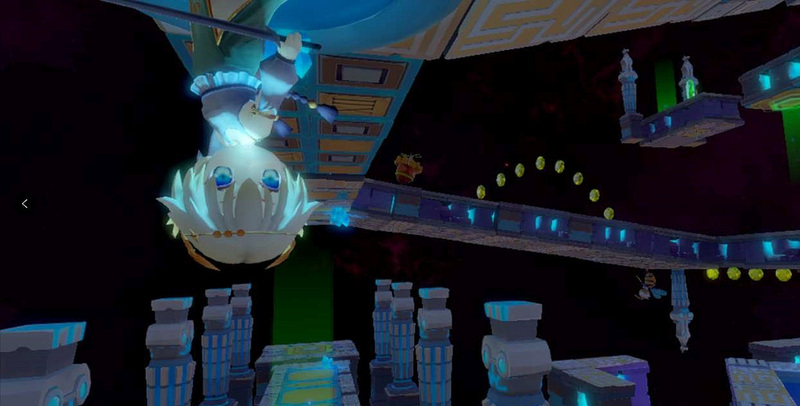 She will navigate puzzles incorporating gravity, ice, moving or rotating platforms and even battles. The visuals are very simplistic but get the job done. The plus side of this is that the game runs very smoothly. Many of the characters and enemies are portrayed in a really cutesy manner that wouldn’t look too out of place in a JRPG. It’s a fairly inviting art style, however don’t let it deceive you into thinking this game is a pushover. For the first couple of levels things are very simple to get you used to the controls. Admittedly, there is quite the learning curve to the game and I would suggest spending time running around and jumping to get used to the game physics. They work well enough for what they are, however the game eventually introduces enemies and platforming challenges. This is where the game becomes really good, but also a bit frustrating. Some of the platforming is really precise and at times requires almost twitch reflexes that you typically would have for a game played with a traditional controller. The problem is this is a game that is almost entirely motion-controlled. Also I noticed that there is a slight delay and recovery time after each jump, so don’t expect to be jumping multiple times in succession. Combine this with the fact that your character can only take one hit before biting the dust, and you have a game that can quickly become annoying just as much as it can be satisfying. Having to manage the camera, time your jumps, avoid or attack enemies and move forward in the levels can prove to be a very demanding task considering the control scheme, especially when those things need to be done at the same time. 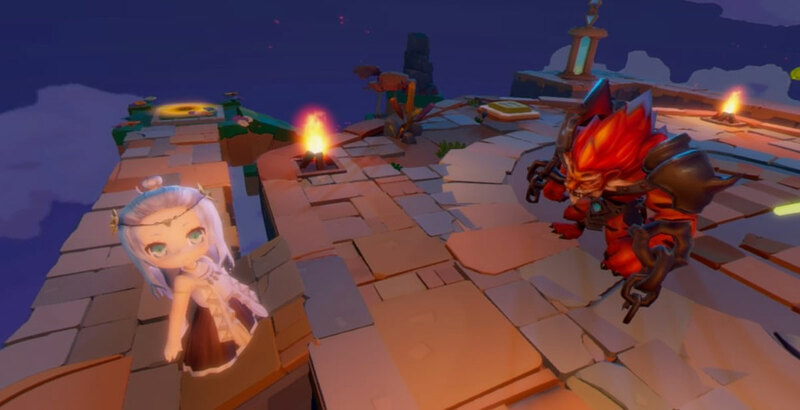 After a few levels the princess gains a sword and the ability to attack enemies, turning Light Tracer into more of an action game. While this is nice, the sword range leaves a LOT to be desired and you really need to get up close to the enemies in order to defeat them. Once again the one-hit deaths add a layer of frustration when it basically turns each encounter into a do-or-die scenario. With some practice though, you should be able to get through most of what this game has to throw at you. However at times I couldn’t help but feel the puzzles should be a bit more polished and balanced considering the control scheme. In the fourth world I came across an issue which might have been a glitch. It is an ice world and you are allowed to move certain objects into the ice to prevent your character from sliding the full length of the ice. You are meant to use this in one of the puzzles, but it simply did not work for me initially as the character kept clipping through it. Eventually things started to work again and I was able to get past it, but that was a weird one-time glitch I encountered. Light Tracer gives the players unlimited continues, meaning that death is a relatively minor setback. I will say that there is a certain sense of satisfaction when you finally get to that “aha” moment and figure out a puzzle or boss battle. The bosses are an area I feel the game could use some extra polish on. It is not unusual for you to encounter a boss that uses a new game mechanic that not only isn’t really explained to you, but isn’t present in any of the other levels. This made some of these puzzles feel very weird and sometimes out of place. As a result I ended up resorting to a lot of trial-and-error in order to get past them. The game features lots of tutorials in the first chapter, so it could have potentially benefited from giving the player some more explicit clues. I mentioned earlier that one hit will defeat you, so that also means you have to essentially have a perfect run on these bosses and there are no checkpoints between battle phases. Some of the fights are fairly lengthy, so patience is definitely required in order to get past them. They did seem to get a bit easier later on in the game, but that could also be due to myself getting more accustomed to the controls and game physics. One of Light Tracer‘s strongest elements is the music and voice acting. Between each world you are treated to a cute little cutscene of the princess talking to you. Her lines were really well done and made her a fairly likeable and charming character. A neat little Easter egg is that you can give her a head-pat if you move the left hand close to her head. Beware though; if you do this she will stop in her tracks, so if you are trying to move her around the level and accidentally put your left hand too close to her, you can make her vulnerable to an enemy. Keep that in mind and you can save yourself from a few otherwise easily avoidable deaths. The music was absolutely excellent and felt like something that could have been in a JRPG. With a nice variety of tunes, it really adds to the atmosphere and makes the game much more relaxing as you are dying multiple times, trying to figure out a puzzle or boss. For $14.99 Light Tracer is a cute little game, however it is also one that requires a lot of patience. As a result, I would imagine that this game’s appeal could be limited so I would highly recommend checking out videos of the game before you buy it. You also need to have the PlayStation VR set along with the Move controllers like I did, making this a pricey game to play if you don’t already own the hardware. Some might be put off by really challenging gameplay and trial-and-error sometimes being required to get past the levels. However, if you like what you see and feel like Light Tracer would be up your alley, give it a try.